PaleoCAR implements a correlation-adjusted regression of tree-ring series with 100+ years of contemporary data modeled by PRISM at an 800-m scale to retrodict climatic variables, notably precipitation and temperature over the last 2000 years. The PaleoCAR research began under a NSF-funded CNH grant, Coupled Natural and Human Ecosystems over Long Periods: Pueblo Ecodynamics (better known as the Village Ecodynamics Project II—VEP II). In that project we synthesized empirical data on known archaeological sites in two large portions of the Pueblo Southwest between AD 600 and 1760. Our analysis of the ecodynamics requires models for the changing distributions through time of potential maize production, which is highly dependent on precipitation and temperature. We coded scripts in R allowing us to reconstruct the location and extent of the niche for dry-farmed maize through time for arbitrarily chosen areas. Bocinsky and Kohler (2014) report on the results for the VEP IIN (central Mesa Verde) and VEP IIS (northern Rio Grande) regions. These scripts work on an arbitrarily defined rectangular area to assemble and weight (via CAR regression) the combination of climate proxies from publicly accessible databases that best reconstructs weather records from the historic period, allowing us to extend this “weather” back as far as the selected climate proxies allow. Our work has concentrated on proxies for climate variables critical to maize production, using a spatial resolution of 800 m, but other climatic parameters could be retrodicted as well, possibly at other scales. We are generalizing and expanding these R tools as a part of the SKOPE prototype. This figure shows an example visualization generated by one of these R scripts. 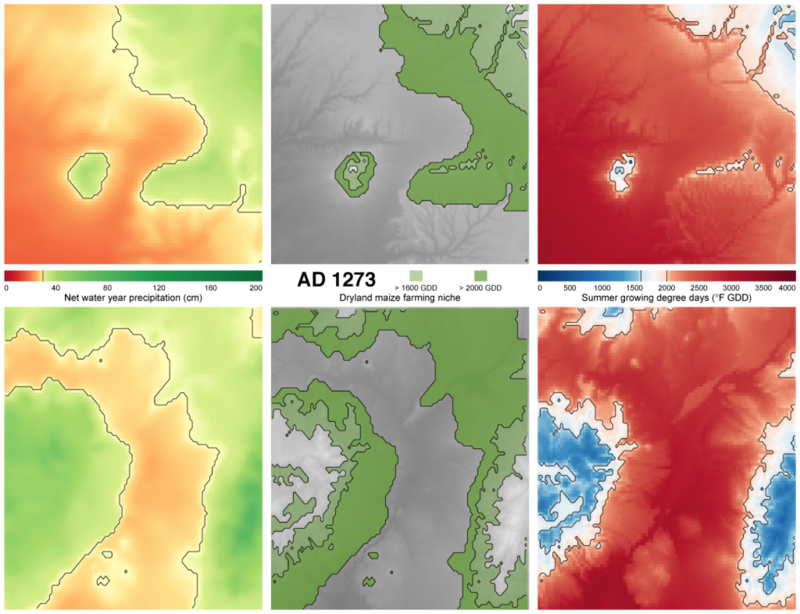 It compares the extent of the dry-farmed-maize niche in the Mesa Verde region (top row) with that in the northern Rio Grande (bottom row) in AD 1273. The left-hand column shows in green areas receiving more than 30 cm precipitation (an approximate minimum for maize); areas receiving less than that are red. The column on the right shows, in shades of red, areas with enough Growing Degree Days (2000 GDD [F]) to produce maize, and in white, those areas experiencing between 1600 and 2000 GDD, which is marginal but possibly adequate, depending on the maize variety. Areas in blue on these maps are simply too cold for maize. In the middle column we overlay these requirements to estimate the spatial extent of the maize-growing niche. Areas in gray are outside the dry-farming niche (though in the northern Rio Grande some of these could be brought into production through surface-water management). Areas in light green are inside the niche, though the growing season may be marginal. Areas in dark green are definitely in the niche. *PI: Kohler; Co-PIs: Allen, Kobti, and Varien; DEB-0816400. Bocinsky, R. Kyle and Kohler, Timothy A. 2014 A 2,000-year reconstruction of the rain-fed maize agricultural niche in the US Southwest. Nature Communications, 5:5618. doi: 10.1038/ncomms6618.